The process of joining fabric or seam is called Sewing. Matching according to bundle no. 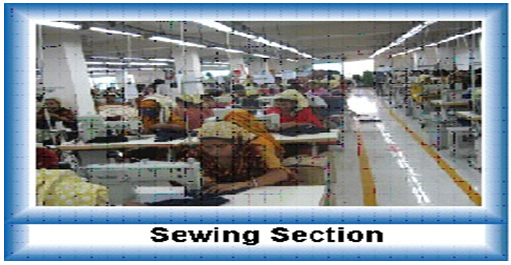 After sewing, the sewn area is observed for any defects, if present which affects outlook. Normally it is expected that there will be no defective view of stitches, seam pucker, or unsightly view. Seam Strength: Strength of a seam should be equal to or slightly less than the fabric strength. Seam elasticity: Elasticity property of a seam should be equal to or greater than the fabric elasticity. Durability: Durability of a seam equal to or greater than the durability of the fabric. Especially during wear and washing, the seam should not fail or damage due to frictional forces and tension. Security: During normal use of apparels, the seam should not fail due to simple reason. Confidence of normal stability of seam is the security of the seam. If the seam fails due to normal reason the situation might be undue. Comfort ability: Apparels, during normal use should not create any irritation or problem to body and health as well. Special property: If clothing has any special property like water proof, fire proof, chemical resistant, etc then in manufacturing this apparel the seam should be produced in such away that the seams have also such special property. 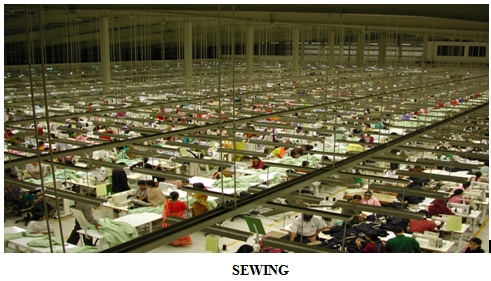 Line balancing is the allocation of sewing machine according to style and design of garment. It depends of that what type of garment we have to produce. Line balancing is a main part of a mass production. These kinds of systems, regardless of being different in details, are workstations in a sequence. Row material is included in the line at the beginning or in the middle. Parts included in the system transfers from one workstation through the other and at the end leaves the system as a completed product. Transfer lines uses manpower very little when compared to assembly lines. The certain properties of Transfer lines are transfer and process of a product automatically through a line. It becomes possible to deliver goods at right time at the agreed quality for least costs. BTTM HEM SIDE TAB ATT. N.B: Stitch type at each and every point must be followed carefully. Some samples (counter sample) are hung at the top of the line to facilitate easy production. The line supervisor and line quality controller must keep keen supervision to ensure desired quality.